Nedward Flanders Sr: Hey all you hepcats, or “Hep-C’s” as I like to call you. I’m back in Springfield, man! Nedward Flanders Sr: What do you mean? I don’t remember anything up until a minute ago. 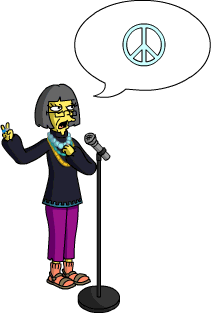 Capri Flanders: We don’t remember a lot of stuff on account of so much reefer-ino. Nedward Flanders Sr: Whoa. Far out man. My brain traveled to like another astral dimension, but my body never left town. That’s so freaky-deaky, man! Capri Flanders: Whoa. The light out here is so bright. And the air is so crisp and clear! Nedward Flanders Sr: You’re right, we’d better find a smoky basement before we lose our edge. Nedward Flanders Sr: Wow, all that time away really cleared my head. I’m starting to think differently. Capri Flanders: Me too. I’m losing the urge to say “man”, man. Ned: Mother and Father Flanders?! You’re back! I’m pleased as a bee’s knees! Sorry, all that rhyming’s probably too square for you guys. Nedward Flanders Sr: Not in the slightest, Ned. Your conservative looks and manner add structure to your life. Ned: Uh, are you guys okay? Nedward Flanders Sr: We are now that we’re thinking clearly. Will you excuse me? I need to smash these stupid bongos. Nedward Flanders Sr: Ah, that’s much better. Peace and quiet. Capri Flanders: We’ve come to realize that no one besides the person playing bongos enjoys them. Ned: How can you say that? Those drums brought you so much joy! Lisa: Yeah, you guys love jazz. Capri Flanders: Lisa, don’t be so childish. Nedward Flanders Sr: A standard 4/4 beat is really much better to tap your foot to. Capri Flanders: Jazz is really a bunch of unlistenable garbage that pretentious people act like they can appreciate more than other people. Ned: So since you guys don’t like jazz or railing against The Man anymore, what would you like to do? Nedward Flanders Sr: Well it is Sunday, don’t you usually attend church? Ned: I wouldn’t want to bore you. Capri Flanders: Nonsense, Ned. Those Bible parables you’re so fond of could shed some light on our modern-day troubles. Lovejoy: Ned, we need to talk about your parents. Ned: I’m sorry, Reverend. I won’t ever bring them back here again. Lovejoy: Why not? They’re great! I want them front and center next Sunday. Homer: Why the long face, Flanders? Someone steal your lawn chair? ‘Cause that was me. Ned: No, it’s my parents. Ever since they came back, they’ve been acting different. They’ve been acting… like me. Nedward Flanders Sr: Hi-dilly-diddly-ho, Homerino-ino! Ned: I never realized I was so dang-diddly annoying! Homer: Wow, Flanders, you hate yourself. I’ve never felt closer to you in my life! Nedward Flanders Sr: What do you say we climb the stairs and say our bedtime prayers. Ned: Don’t you ever get sick of being a slave to the man, man?! Wake up! Nedward Flanders Sr: It’s too weird seeing Ned act like that! Capri Flanders: It’s freaking me out! Nedward Flanders Sr: I’ve got to have a puff to calm me down. Capri Flanders: Me too, man! Ned: Status quo, man! Status quo! Nedward Flanders Sr: Ned, man, you’ve got your priorities all wrong! Capri Flanders: Every life choice you’ve ever made has been backwards, man! Ned: Ah, it’s good to be back to normal. Principal Dondelinger: Finally, some quiet time to reflect on all the students whose lives I ruined by enforcing petty rules. Homer: Principal Dondelinger? I didn’t know you would be here. This is perfect, we can golf together now! Principal Dondelinger: Simpson, I’m having a quiet evening alone. Now if you don’t mind, please leave me be. Homer: I get nervous on the first hole too. Let me help you tee your ball. *knocks golf bag into pond* Oops! Principal Dondelinger: You Neanderthal! Can’t you go five minutes without ruining someone’s day? Have you ever had an intelligent thought a day in your life?! Homer: Does it count if I realized the intelligent thought I had was actually from a Mentos commercial? Principal Dondelinger: I apologize for my behavior, Simpson. However, please leave me alone. All I wanted was to play golf in peace. Maybe I can salvage the night, I mean I only get to golf once a week. Putting practice should calm my nerves. I’ll just hit a few balls then be right as rain. Homer: I bet you can’t hit it further than I just did. That’s a new record, I almost got it ten feet away from the tee. Principal Dondelinger: The only thing that pairs better with the sunrise is an empty golf course with my name on it. Homer: Fore… head! We’ve both got huge foreheads! Principal Dondelinger: Simpson! What are you doing here at this hour? Homer: *stumbles* The trick to getting up early is setting a couple alarms, and then never going to bed. Principal Dondelinger: There’s no way Simpson can ruin the Golfing Geezers contest. You have to use your dentures as ID at the door. I wonder which sap I’ll get paired with. They should consider themselves lucky. I’ll carry our team through this thing. Homer: Hey, partner! Don’t tell anyone, but these pinstripe pants are just from me sitting on a freshly painted bench. Principal Dondelinger: I truly am in hell! You don’t even like golf, why do you keep coming here?! Principal Dondelinger: I can’t take this anymore. I’m retiring from retirement. The only natural solution to my problems and outbursts of rage is to become a high school principal again. Then I’ll finally be rid of that lush, Simpson. Homer: Yeah, at least you’ll be rid of that jerk…who are we talking about again? Principal Dondelinger: *convulses* Simpson!! I must have done something terrible in a past life, like eaten pizza with a fork. And this concludes the two premium questlines for Week 2 of Love, Springfieldian Style! Thoughts on the questlines? Did you buy the Hippie Flanders’ or Principal D? Thoughts on the dialogue? Sound off below, you know we love hearing from you! 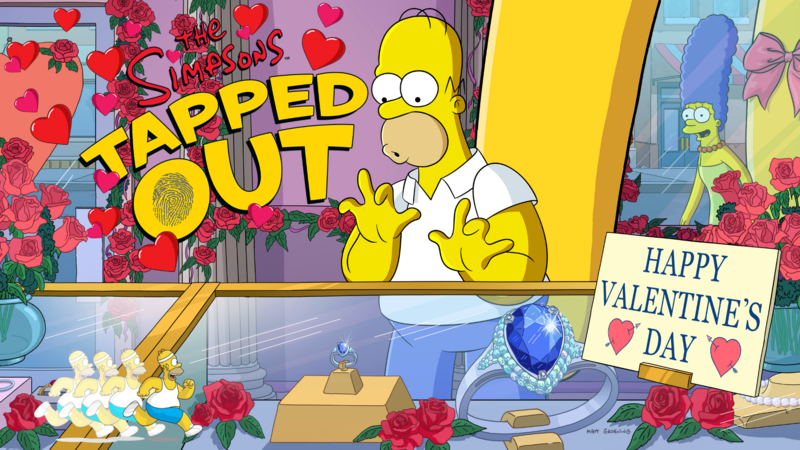 This entry was posted in Tips and Tricks, Updates and tagged 2019 Valentine's Day, capri questline, Jive-irino questline, Love Springfieldian Style Event, Nedward questline, principal dondelinger questline, Ride or Die questline, Tapped Out Tips and Tricks, The Simpsons Tapped Out, TSTO Act 2 Premium questlines, TSTO Addicts, TSTO Love Springfieldian Style, TSTO Tips and Tricks, TSTO Valentine's Day Event, TSTO Week 2 valentines questlines, vicki valentine questline. Bookmark the permalink. Eating pizza with a fork is a sin worthy of eternal damnation. Poor principal Dondelinger. You may need to free up some space on your decide. I have my hair. I have huge calves from football. So… no.